Location: Maynooth, County Kildare, Ireland. Ownership / Access: Open to public with limited access possible. 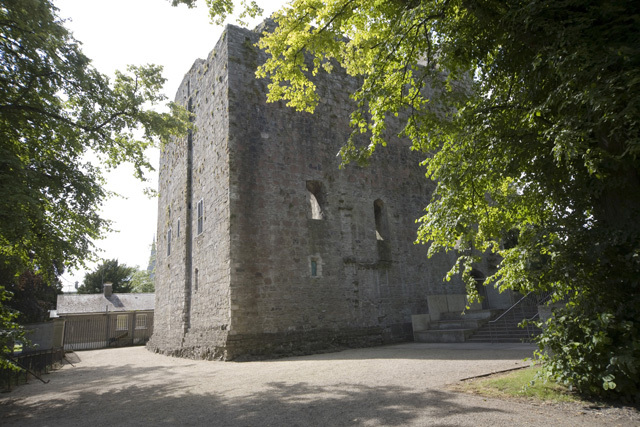 Opening Times: June to October, 10.00 a.m. - 5.45 p.m.
Notes: Maynooth Castle is a ruined 12th century castle in Maynooth, County Kildare, Ireland which stands at the entrance to the South Campus of Maynooth University. The area covered by modern Kildare was granted by Strongbow to Maurice Fitzgerald in 1176. The castle was built at the junction of two streams in the late 12th century and became the home of the Fitzgerald family from then on and was expanded by Sir John Fitzgerald in the 15th century. The Fitzgeralds became the Earls of Kildare and Lords Deputy of Ireland. The Fitzgerald occupation of the castle ended with the 1534 rebellion of Silken Thomas, the son of the ninth Earl of Kildare. An English force led by William Skeffington bombarded the massive castle in March 1535, the heavy modern siege guns of the English army making a ruin of much of the Medieval structure. The castle fell after a ten-day siege and the garrison summarily executed before the castle gate. Silken Thomas was captured shortly afterwards and committed to the Tower of London with his five uncles. They were executed for treason at Tyburn on 3 February 1537.The Castle was restored in 1630-35 by Richard Boyle, 1st Earl of Cork, after his daughter had married George FitzGerald but much of this building was destroyed in the 1640s during the Eleven years war. Only the gatehouse (on which united arms of the Boyles and FitzGeralds can still be viewed) and the Solar Tower survive. The Fitzgeralds left Maynooth for good and made first Kilkea Castle and then Carton House their family seat. Restoration work on the castle was restarted by the Office of Public Works in February 2000 to develop it into a Heritage Site. It is now open to the public from June to October, 10.00 a.m. - 5.45 p.m.. Today the partly ruined building remains as a tourist attraction, with limited access possible.